Why? The student profile tells teachers/conversation partners your precise Language Learning needs, the language you need to learn/practice, your Level, and other useful information. This guide outlines creating a Student profile. For information about creating a General profile, please see the Creating a General Profile guide. The Student profile contains information about which languages you would like to learn and includes information about your learning needs, learning level and your availability. The Student profile also contains information so that suitable teachers can contact you. When you first login to the LingWorld.com site, you will be directed to My Classroom. From here, you can create your Student profile. 1. Click the Create profile button on the My Classroom screen. The Student Details – Describe your language learning needs screen displays. 2. 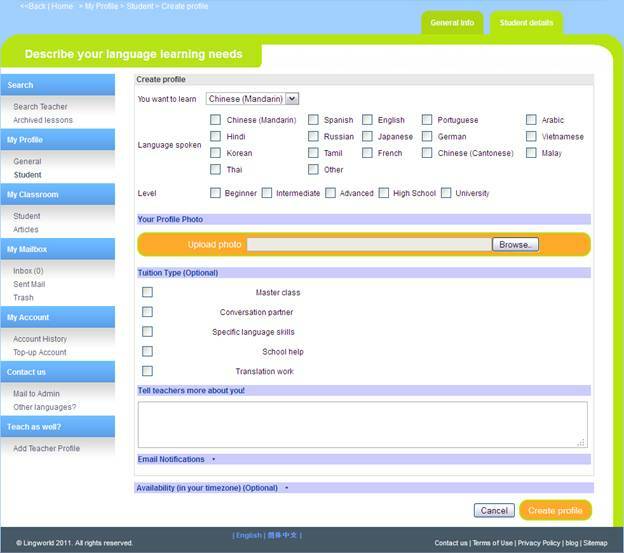 Fill out the Student Details – Describe your language learning needs fields as accurately as possible. The Student Details – Describe your language learning needs fields are described below. 1. Click the Browse button in the UploadPhoto section of the screen. There are several types of tuition to choose from. Choose the tuition type that best matches the type of help you are looking for. Options include MasterClass, ConversationPartner, SpecificLanguageSkills, SchoolHelp and Translation. Note: TuitionTypes vary by language and are not available for Spanish and Japanese. 4. Once you are satisfied with your profile, click the Create profile button. A summary screen displays, showing your profile. Click the Modify button to make any changes to your profile. 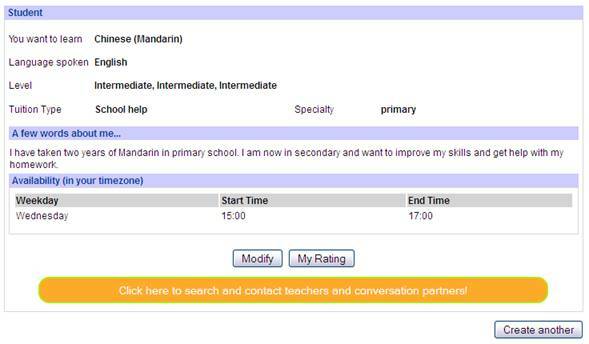 Click the My Rating button to view feedback from teachers (feedback will be blank until you’ve taken some classes). Click the Create another button to create an additional profile. This is necessary if you plan on learning more than one language using LingWorld.com. Instructions for setting up an additional profile are found in the Creating a Second StudentProfile guide. Your Student profile is complete.